Wind power provides an effective way to reduce carbon dioxide emissions as well as being a secure and reliable source of energy for the United Kingdom, according to a new report. The 22-page report by the Institute for Public Policy Research (IPPR) notes that much of the opposition to wind power in the UK appears to be based on the mistaken belief that it is an ineffective technology. “Wind power can significantly reduce carbon emissions, is reliable, poses no threat to energy security, and is technically capable of providing a significant proportion of the UK’s electricity supply with minimal impact on the existing operation of the grid,” says the report — Beyond the bluster: Why wind power is an effective technology. 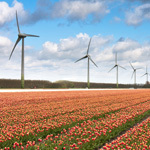 Researched in conjunction with GL Garrad Hassan, the world’s largest dedicated renewable energy consultancy, and peer-reviewed by Professor Nick Jenkins of the Institute of Energy, Cardiff University, the report noted that onshore wind is one of the most cost-effective of the low-carbon technologies. “With continuing government support, the average wind farm globally may produce power at costs that compete with fossil fuels as soon as 2016,” the report said, adding the generating technology keeps down the costs of reducing emissions and can help meet the 2020 renewable target. The report says that offshore wind is currently more expensive than onshore wind but the cost difference is expected to decrease rapidly. Offshore wind, it added, can provide huge amounts of low-carbon electricity for the UK, make a major contribution to the 2020 renewables target and generate significant economic benefits. In terms of reducing carbon emissions, the report found that wind turbines convert wind into electrical energy without emitting polluting gases. “Using a simple model we show that every megawatt-hour (MWh) of electricity produced by wind power in Great Britain results in a minimum CO2 saving of around 350kg.” the report said. Noting that 75 nations have some wind power installed with 21 of these having more than 1GW of wind power capacity, the report added wind power is a secure and reliable energy source. In its conclusion, the report unequivocally notes that wind power is a potent method of reducing carbon emissions, is reliable, does not threaten energy security and it is technically capable of providing a significant proportion of the UK’s electricity supply with no impact on the security of the grid. Droughts and massive Arctic ice melts this summer have reminded the world of the dangers of failing to prevent climate change. Last week the World Bank announced that global food prices jumped 10% in July from the month before, driven by the U.S. drought which has pushed the price of grains to record levels. This is the drought that NASA scientist James Hansen linked to ongoing climate change. Tomorrow, international development organisation Oxfam will release a new report which shows how climate change contributes to food-price spikes.